This photo was taken months ago, exactly during my birthday. My boyfriend gave me this birthday treat because he knows that I'm going to die (naaah.) if I won't be able to have a sip of my favorite Signature Hot Chocolate. FAIL VERDICT: Sometimes, the taste of their Hot Chocolate varies, sometimes it's too sweet, too bitter or LASAW! Very disappointing. 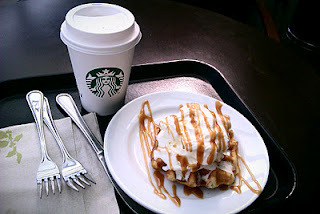 Starbuck's everyday or twice a week - Good or not? Good for those who have a monthly income of P12,000 and above. Bad for those whose income is just above minimum. Truth: Nonetheless, it's alright to splurge and treat yourself once in a while. That's why we are working, we want to try the best things in life! Another must-try if you have extra money would be Bo's Coffee Premium Hot Chocolate. Comment: Hinding hindi ka mapapaso sa presyo! Dunkin Donuts: Another a wow! classic from DD. I usually order their Hot Choco + Donut Combo for P50. I totally forgot the actual price of their Hot Choco but definitely not as expensive from those sold in Coffee Shops. Comment: Sweet and hot - perfect for the cold nights! Mc Donald's: It's the famous barkada breakfast for Filipinos! For only P35, it is guaranteed to make your day. You can pair it with their pancakes or sausage mc muffin. Comment:Creamy and sweet! Perfect for the "just chilling" days.